How Do I Configure the Stripe Giving Form Embed? If you have the above access and permissions, you are ready to get started with configuring Stripe! In Virtuous, navigate to the Settings menu and go to the Connectivity page. Click " Manage Application Keys." 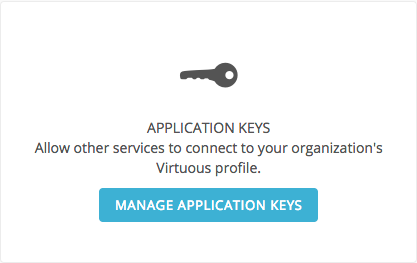 On the Application Keys page, click on the blue "Create an Application Key" button. Select "Stripe" from the drop-down menu, and then click "SAVE" to generate a new app key. This app key will be used later when embedding the Stripe form code on your web page. 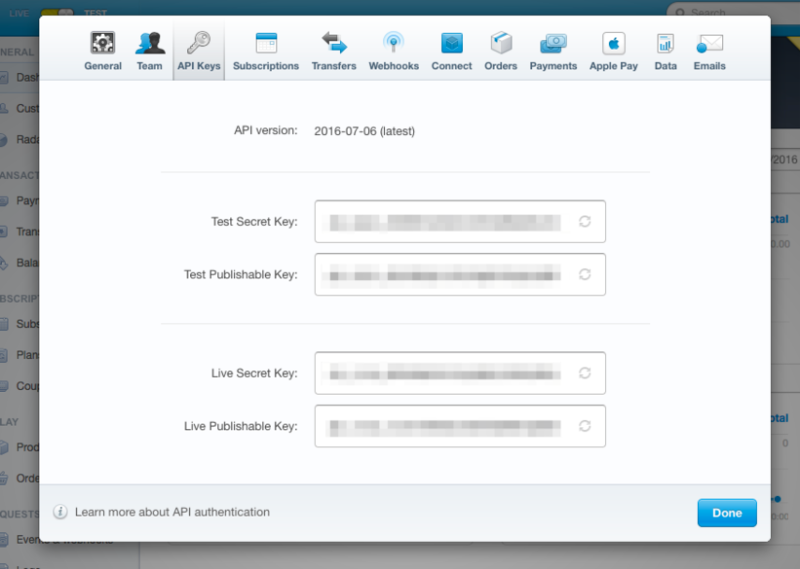 Once you have generated your app key, you will need to go to your Stripe account and generate API keys. Stripe provides multiple keys. The two keys labelled "Test" can be used for testing the Virtuous integration, if desired. Once the integration is tested and functioning properly, these keys would need to be replaced with the "Live" keys. For each, you will need both the "Secret" key and the "Publishable" key. 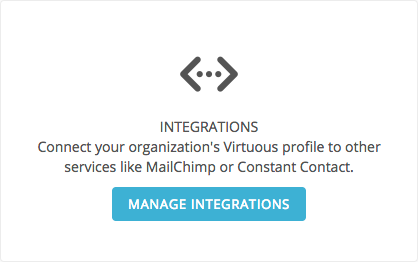 Once you have your Stripe keys, go back to the Virtuous Settings menu, go to the Connectivity page, click the "Manage Integrations" button. Click the button to Add an Integration and select Stripe from the drop-down menu. On the next screen, paste the SECRET API key generated in your Stripe account. Once the Stripe integration has been set up, it will show as "Disabled" by default. Be sure to click the red box to enable to integration in order to activate the sync. To find your specific Virtuous Organization ID, contact the Virtuous support team. 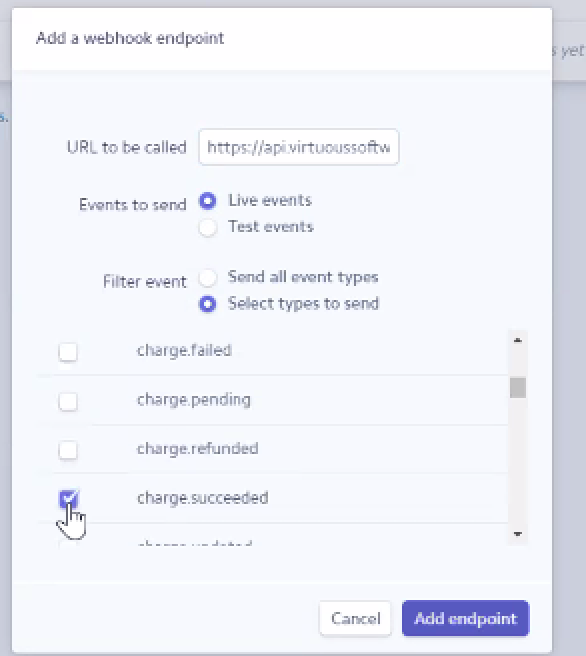 You may choose to have the webhook respond to test events for testing your configuration, but be sure to select live events in order to actively deploy the giving form embed on your website. Finally, for the Filter option, choose "select types to send" and then select "charge.succeeded" from the menu. Congratulations! You've successfully completed setting up your integrations and collecting the keys you will need to embed the Stripe giving form on your web page. Now, you'll need to install the code on your web site, on any page where you'd like to display the giving form. Be sure to replace the capitalized text with the keys generated in Part 1. Segment and Project values are purely optional. Listing Projects will allow givers to select a Project for their gift and pass that value to the Virtuous transaction tool. Coding a Segment into your form will pass that value along with the gift information and provide tracking on the source of the gift. For more information on these features, check out our Getting Started Guides on Campaigns and Projects. Once the giving form has been embedded on your web page, you'll want to style the form to match the CSS of your existing page.